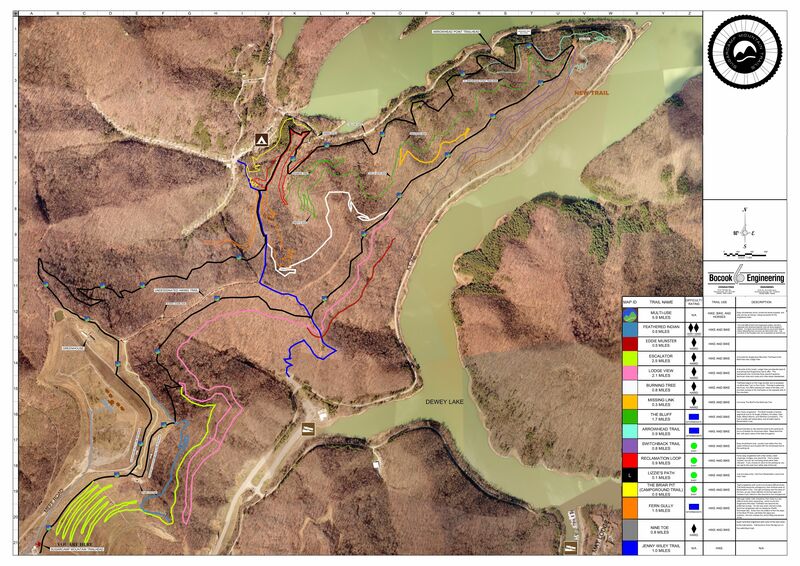 Nestled deep within the mountains of Eastern Kentucky, the Sugarcamp Mountain Trail system is a multi-use (mountain biking, hiking, & horse) facility created through a joint effort by Jenny Wiley State Resort Park and the city of Prestonsburg. Sugarcamp includes roughly 6 miles of horse-friendly, machine-built trail which provides spectacular views of Dewey Lake and the surrounding area; as well as an additional 12 miles of hand-carved, technical singletrack dedicated to mountain biking & hiking. Trail difficulty varies (and is indicated at all trailheads), but at least an intermediate skillset is required to navigate all trails within the property. The Sugarcamp Mountain Trailhead is located along Sugarcamp Mountain Road (formerly Meff Road and may still be marked as such on maps), near Stonecrest Golf Course and provides access to the upper reaches of the trail system without the long ascent associated with the Arrowhead Point Trailhead. Sugarcamp Mountaint Road is located along KY Route 3024, which is accessible from both Prestonsburg and the Jenny Wiley State Resort Park. This trailhead provides several connection options, which include either a clockwise or counter clockwise route on the multi-use trail, or a unique singletrack connection with the Escalator Trail. The Arrowhead Point Trailhead is located along KY Route 302 (Lake Road), approximately 1 mile from the Jenny Wiley State Park campground entrance. This trailhead provides access to any of the singletrack trails via the multi-use trail, although some ascent is necessary when heading either direction. If climbing isn’t your cup of tea, it is highly recommended to do the 5 minute shuttle to Sugarcamp Mountain Road and access the trails from the Sugarcamp Mountain Trailhead. Shuttle service will soon be provided by the State Park, information will be provided when that service becomes available. For a detailed description and interactive map of every trail on the system, visit the trail page at MTBProject.com. Also, be sure to check out our Twitter and Instagram feed below for the latest info on upcoming events and trail conditions. The view from the trail. Click any image for larger version. Filmed in 2017, this video shows off some of the mountain biking trails available on the system including some of the more recent additions and updates. An older edit of some of the trails. A lot has changed since this video was made. Stay up to date on events and news. Special thanks to People for Bikes. Click their logo above to visit their website and consider making a donation.